Hover your mouse pointer over the Settings menu item on the navigation menu. Click the General link on the Settings submenu. Enter the name of your blog in the Site Title text box. You can revisit this page anytime and change the blog name as often as you like. In the Tagline text box, enter a slogan or a motto that describes you or your blog. The tagline should be a short (one line) phrase that sums up the tone and premise of your blog. Enter your e-mail address in the E-Mail Address text box. 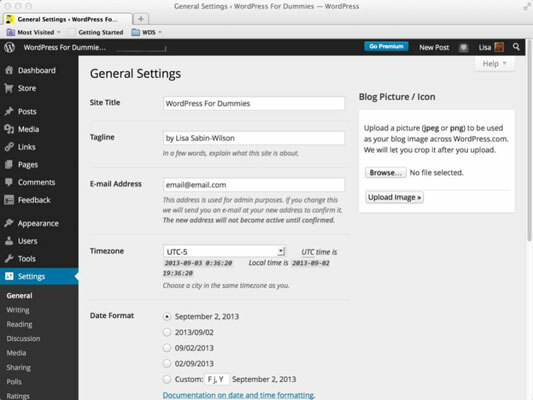 Enter the e-mail address that you used to sign up with WordPress. You can change this address, but be warned: If you change the e-mail address here, it won’t become active until you confirm that you are in fact the owner of said e-mail address. Confirmation is simple: WordPress sends an e-mail to that address, providing a link you click to confirm that you are the owner. This e-mail address is used for administrative purposes only, which consists mainly of communication between you and WordPress.